The front desk staff has a variety of critical tasks to complete that will directly affect patients and the practice. Clinicians can make the job of the front desk easier, more efficient and help grow their practice with integrated software that has the ability to automate many of the duties for which the front desk is responsible. The front desk staff is the first person a patient comes in contact with when they schedule an appointment and when they arrive at the office. People make snap judgments and a patient’s first impression of the practice will be dependent upon their interaction with the front desk. The person at the front desk must be pleasant, knowledgeable and efficient. They must possess people skills and like working with the public. Not everyone has the necessary skill set for the job and clinicians shouldn’t hesitate to shift staff around to ensure the first impression a patient has of the practice is a pleasing one that makes them feel comfortable and eager to come back when they need services. The front desk is responsible for scheduling appointments, obtaining essential information and sending reminders. A lot of information is obtained in a very short time from patients, ranging from eligibility and identification to secondary insurance and contact information. Scheduling can be completed directly from the In Touch EMR™. Many of those tasks can be accomplished automatically with In Touch EMR™. Eligibility can be determined online with hundreds of insurers. Payer information is built in and new companies can be added. Patient demographics come straight from the insurance company, resulting in fewer claim denials. With a single action, a patient file can be created and all the data will be transferred automatically. In Touch EMR™ is the only EMR software that has an app specially designed to work with the iPad. Patients can take a photo of themselves with the tablet for identification and even fill out patient forms. The information received via the iPad is automatically transferred to the patient’s file. A clinician’s front desk should also be doing marketing and In Touch EMR™ provides the necessary tools. When intake information is obtained, all the needed contact data is available to send reminders, greetings, newsletters and special offers. In Touch EMR™ has built in functionalities that enable practices to contact patients via phone and email, voice and text message, along with traditional mail using built in greeting card software. In Touch EMR™ can be used with the automated Therapy Newsletter or Clinical Contact software systems. 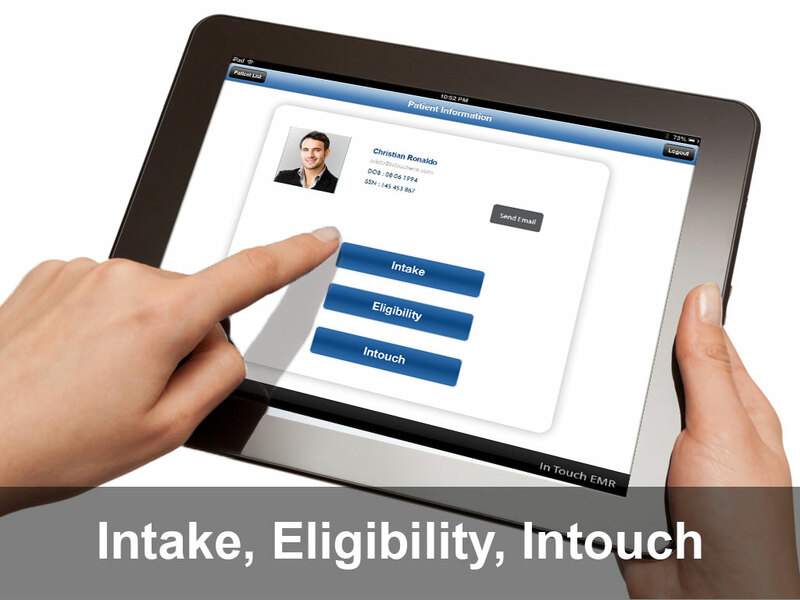 In Touch EMR™ simplifies the entire front desk process, from intake to maintaining contact. The software helps reduce reimbursement denials, automatically creates patient files, and helps practices maintain contact with patients through reminders and newsletters. Practitioners must work harder than ever to retain patients and generate new clients. In Touch EMR™ is a single source solution to automate and market practices.